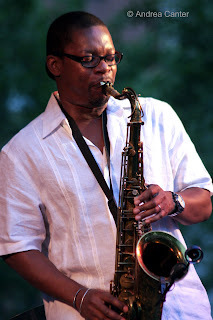 I first heard the Ravi Coltrane Quarter three years ago at the Dakota Jazz Club, again this past March at Ted Mann Auditorium as part of a double bill with the Roy Haynes Quartet, and now as the headliner for the Twin Cities Jazz Festival weekend at Mears Park in St. Paul last Saturday night. One of the elements that makes this one of the tightest, most exciting small bands in modern jazz is its consistency in personnel—pianist Luis Perdamo, bassist Drew Gress and drummer E.J. Strickland have been co-conspirators since the release of In Flux in 2005, each bringing a unique style and energy to a repertoire of largely original compositions. A few minutes of light rain started their set at Mears Park but only drew the audience in closer, with Ravi’s encouragement, and the band played on, the journey including the original “World Order” and twists on Monk’s “Round Midnight.” Playing mostly on tenor, Ravi is an elastic improviser with endless ideas, but also a generous leader who recognizes the other three talents on stage, giving them plenty of space to design and resolve their own puzzles. 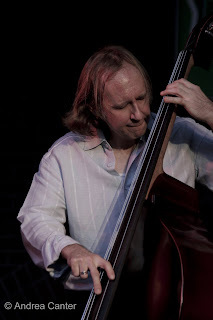 Drew Gress, who appears with some of the most fascinating ensembles in jazz (most recently at the Walker Art Center with his own Seven Black Butterflies band), contorts and twists around the bass as if auditioning for the Pilobolus Dance Troupe, while coaxing solos that perfectly balance the thrust of the music. If intimidated by the Coltrane brand earlier, Ravi today has the confidence to not only break free but pay homage to his lineage as well, as he did Saturday night to honor his late mother Alice, covering one of her compositions with soaring spirals at the tenor’s high end, while drummer E.J. Strickland provided nonstop thunder (prompted by the weather?). 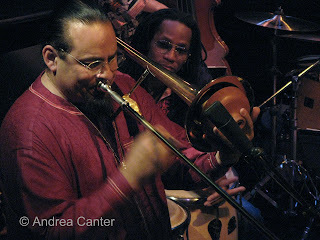 And as he did in March, boldly acknowledging his legacy, Ravi and the band closed out the night with, what else? John Coltrane’s own masterpiece, “Giant Steps.” Somehow there is no disputing heredity, yet there also is no doubt that this Coltrane has taken his own Giant Steps. Genius here extends across generations, the son’s path informed, not confined, by the name Coltrane. 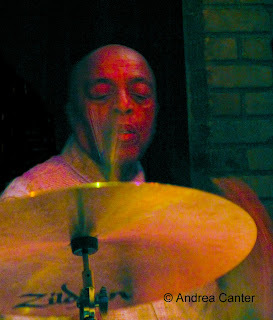 I think I first heard legendary drummer Roy Haynes live four or five years ago at the Artists Quarter in St. Paul. The AQ is not a typical stopover for artists of his stature, but Roy has a special relationship with AQ owner and fellow drummer Kenny Horst. He’ll bring his band into the AQ about every two years and fill the room for three nights of the most joyful bop magic on the planet. And the fact that Roy is 83 and still burning behind the trapset is the definition of “legend.” An alum of the bands of jazz titans from swing to bop and beyond (from Louis Armstrong to John Coltrane, from Miles Davis and Dizzy Gillespie to Pat Metheny), it might be Haynes’ influence on the future of jazz that will be his most significant legacy. Like another legendary drummer, Art Blakey, Roy Haynes has become the master baker fueling the rise of a new generation of stars, including two of the finest sax players of the 21st century, first Marcus Strickland, now Jaleel Shaw. The Roy Haynes Fountain of Youth Quartet – Haynes has about as many years alone as his three sidemen together—is one of the most consistent, high octane mainstream ensembles on tour and on record. In the Twin Cities, we’ve been lucky enough to have FOY in town twice in the past three months—at Ted Mann Auditorium with the Northrop Jazz Series in March, and this week, a rare stop at the Dakota Jazz Club in Minneapolis. It was an occasion to draw Kenny Horst away from his own club, serving nominally as “co-sponsor” but mostly just sitting back and enjoying the music with the rest of the nearly packed house. There is a certain degree of predictability when the Fountain of Youth performs. There will be at least one tune by Thelonious Monk (“Trinkle Tinkle,” “Bemsha Swing”), and at least one or two from Pat Metheny (“Question and Answer” and, nearly every night, the band’s glorious rendition of “James”). Roy often uses “Summer Nights” as a closer; since his last recording, they bring the house down with a darkly delicious “My Heart Belongs to Daddy.” But there is always variety, from great songbook staples like “Autumn Leaves” and “Everything Happens to Me” to the best bop standards like “Body and Soul,” “Solar,” “Oleo, and more. And “Hippity Hop,” which Roy first recorded live at the Artists Quarter on Where As, is now a much-anticipated solo interlude. That there are few surprises in the playlist is offset by the pure magic of the quartet’s interaction, the sheer enjoyment of their company, the soaring spirits that yield one passionate phrase after another. Haynes knows how to carry his 83-year-old pulse across two sets of nonstop drumming—yielding the floor frequently to his young sidemen, this time taking no prolonged solos until well into the second set. No one is disappointed—the Energizer Bunny of percussion never stops swinging the sticks (or mallets, or brushes), perhaps dropping back to a simple tickling of the rims while a soloist carries on, but never, never taking a break. And each tune gives the other musicians wide berth for setting up and carrying out their own explorations. Martin Bejerano should be as well known as Brad Mehldau or Jason Moran, and probably would be if flying primarily under his own name. Watch his fingers dance across the keyboard-- is it possible to sit close enough to see his brain spinning, spewing out ideas that seem to arrive fully formed? One moment he slides into a Latin bounce, the next minute a bluesy meander, back again to a hard bop cascade of arpeggios and hand-over-hand somersaults. He attacks the keys like a Shiatsu masseur. David Wong, who took over for bassist John Sullivan about a year ago, gave us a slippery double-time solo on “James” and generally mirrored his boss’s pace, at some point engaging each of his partners in a sympathetic duet. 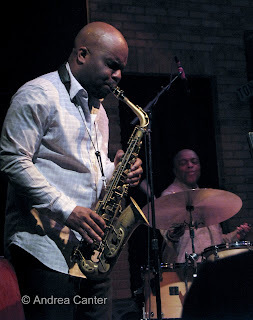 Alto/soprano saxophonist and award-winning composer Jaleel Shaw nearly stole the show, however, filling the air with sinewy climbs, glissando-like dives, songful ballads, and generally exhibiting the physical and artistic energy of his mentor. Roy Haynes packs a lot of entertainment into his small frame. He never stops moving. If he isn’t stroking the skins with his brushes or pounding out intricate artillery rounds with his sticks, he’s jumping up and pacing behind the kit, adding a well-placed hit or cymbal crash. “Hippity Hop” was performed solo with mallets, and here Roy taught a master class in control, never rushing, letting the patterns develop, the decibels rise and fall, each sound telling its own story. The master class was not yet over—noting he was using a “Roy Haynes Signature” snare, he invited “any drummers in the house” to come on stage and try it out. Several responded. If I played drums, even badly, I would have jumped at the chance to climb on stage and take a swat at Roy Haynes’ snare. The band was in town for just one night, jumping over from Madison before returning to New York. It was a “Summer Night” of pure “hippity hop.” And our “hearts belonged to Daddy” Haynes. Much of the impact of good music is subconscious. It can resurface at any time, even 38,000 feet above Wyoming. I had worried needlessly that a week in northern California would dull my recollection of two nights at the Healdsburg Jazz Festival, the two opening concerts held in the small Jackson Theater in Santa Rosa. The venue is perfect for chamber jazz, small enough for intimacy, a great sound system, away from the bustle of this growing Sonoma County city. But the hall was also very dark and my scrawled notes nearly impossible to read days later, with such interfering sensations as driving along Highway 1 toward Mendocino, the best Thai curry I’ve ever tasted, the smooth-as-glass waters of Lake Tahoe, the wind blowing hard through row upon row of new grapes in Russian River vineyards. Aboard a crowded 757 enroute home, indeed some details are gone, but the poetry remains: One night of Fred Hersch and Kurt Elling, another night of Charles Lloyd and his latest configurations including tabla master Zakir Hussein and young piano monster Jason Moran. 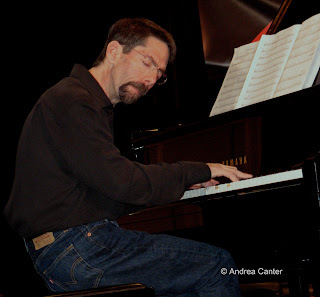 Fred Hersch has intrigued me since I heard his early recordings, interpretations of standards as well as Bill Evans and Thelonious Monk. His affinity for vocalists is well represented in his discography but perhaps never better than his own compositions, setting Walt Whitman’s Leaves of Grass to music in the company of two of the finest vocalists on the planet—Kurt Elling and Kate McGarry. Is there is anyone more elegantly attuned to the nuances of the piano? 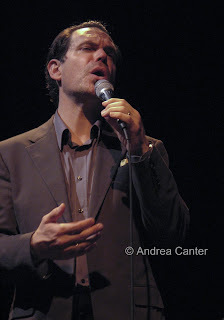 Kurt Elling is to the human voice what Fred Hersch is to the piano, but with a higher profile. He’s equally at home interpreting great standards like “Bye Bye Blackbird” and writing new lyrics for jazz classics like “Body and Soul.” Both musicians use elastic phrasing that they transform into hornlines; both can make you laugh or cry with minimal notes. Their collaboration seems inevitable, stars in perfect alignment. And such an alignment was the opening concert of the Healdsburg Jazz Festival on May 30th in Santa Rosa’s Jackson Theater. Poetry transcends form. Fred Hersch and Kurt Elling, whether reinterpreting Walt Whitman or inventing language in the moment, are complementary instruments, contrapuntal minds, weavers tying souls together with silken thread. Charles Lloyd is another intriguing, somewhat mystical figure on and off the jazz scene over the past five decades. My first encounters with his flute and saxophone came on the early ECM recordings with Keith Jarrett. He was in retreat for a period, resurfacing in the 90s, ultimately in collaboration with the late drummer Billy Higgins, and lately in his trios with young drum master Eric Harland and Indian tabla guru Zakir Hussein. His music often reflects Eastern or Latin folk traditions, and he’s been known to sit at the piano, behind the drum kit, add hand percussion or harrowing sounds of flute, taragato or Tibetan oboe. You’re never sure what his ensembles will perform but you can always count on an evening of globally, spiritually inspired music. 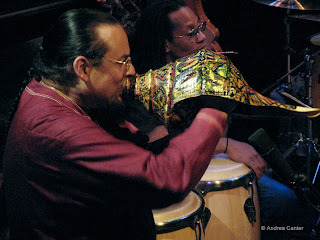 The concert on the festival’s second night in the Jackson Theater was filled with soaring moments and reflective calm, in varying configurations of the five musicians – four of whom now comprise Lloyd’s new “Rabo de Nube” Quartet (with Jason Moran, Reuben Rogers and Eric Harland) and three of whom form the “Sangam” Trio (with Harland and Hussein). Most intriguing were the trading of sounds and patterns among Hussein and Harland, the raw energy created by the addition of Jason Moran’s piano, the pulsations from bassist Reuben Rogers. On flute or sax, Lloyd was masterful, dropping gorgeous arpeggios and sinewy phrases. Sometimes the harmonies evoked Coltrane in Marrakesh, a carnival in Havana. An encore featuring Lloyd’s recitation ended the night in meditation. Again, poetry transcends form. Charles Lloyd and his companions are nomadic storytellers, wandering through centuries and continents. The Healdsburg Jazz Festival is one of those little gems of musical enchantment that seldom receives the press it deserves, but maybe that is a good thing as the festival has maintained a small town intimacy seldom enjoyed at a jazz festival of national stature. Jessica Felix and company have been producing incredible opportunities to hear the best of modern jazz for ten seasons in the heart of Sonoma wine country. In addition to creative musicians with ties to the Bay Area (like Lloyd, Hersh, Billy Hart and young guitar sensation Julian Lage), such giants as McCoy Tyner, Cedar Walton and Frank Morgan have appeared on the festival roster in the past decade. It’s definitely worth the travel from the Midwest. And this year, the stars were in perfect alignment.